At Alberta Dental, Mexico every patient’s smile is a top priority. Their team of dedicated dental experts are committed to delivering outstanding dental care and personalized treatment plans to every individual. Their custom-built facility provides everything that modern dentistry has to offer, from restorative and general treatments to a complete range of cosmetic procedures. Their services encompass the whole family’s needs, helping each patient to achieve lasting dental health and a smile to be proud of. Where Are Alberta Dental, Mexico Based? 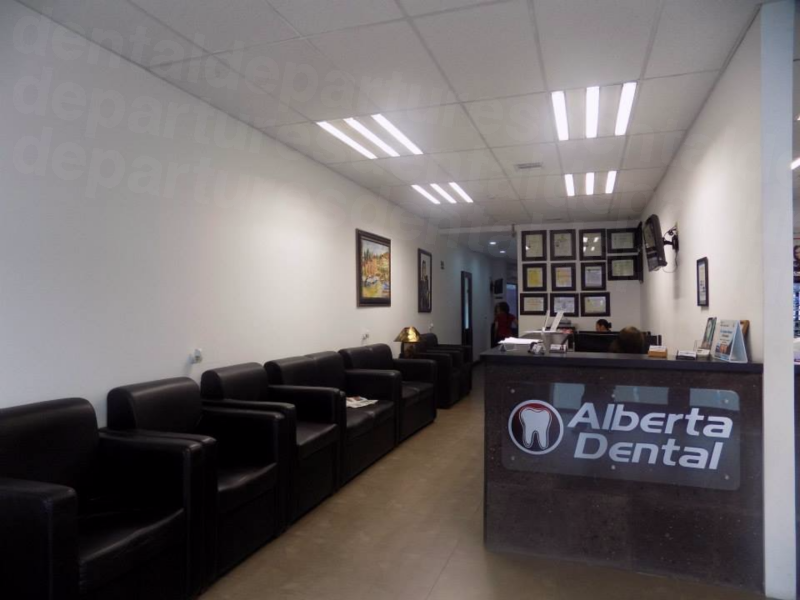 Alberta Dental are located in the Mexican town of Los Algodones, which is the northernmost town in Mexico. Ideally situated just 7 miles from Yuma, close to the borders of Arizona and California, Los Algodones is known as the “dental capital of the world”. There are more than 900 dentists in the town, and over 300 clinics, so it pays to do a little research before you commit to any treatment! The abundance of dental expertise, coupled with its convenient border location, has seen dental tourism in Los Algodones explode in recent years. Patients from the United States and Canada have long-been taking advantage of the huge savings that can be made by undergoing dental treatment in Mexico . Procedures are available for around 70% less compared to the dental fees being charged domestically, which can mean significant savings for the whole family. And the quality of the treatment is in no way inferior as many of the dentists here have trained and worked abroad, gaining accreditations with respected professional bodies such as the American Dental Association. Alberta Dental are highly-regarded dental experts that have built a reputation on delivering professional, outstanding patient care in the comfortable surroundings of their modern dental facility. Every member of their team is dedicated to treating each patient as an individual, providing bespoke treatment plans and encouraging effective, two-way communication between doctor and patient at every stage of the process. The clinic offers a complete range of dental services that includes cosmetic dentistry, root canal treatment, dental implants, orthodontics and gum treatment. By utilizing the latest dental technologies, they deliver comprehensive diagnoses to ensure that the most effective and economic treatment plans are put into place. Jesus Escobedo is a General Dentist and Advanced Surgery Specialist. Dr. Escobedo originally graduated from the University of Baja California and is both an Implant and Root Canal Specialist. Ahidaly Cortes also graduated from the University of Baja California and possesses Advanced Surgery Specialism and General Dentistry qualifications. Jonathan Navarro, Advanced Surgery Specialist and General Dentist, graduated from university of Baja California before completing becoming an Implant Specialist at Nucleo Educacion Avanzada. What Treatments Are Available at Alberta Dental, Los Algodones? This is the branch of dentistry that specializes in the diagnosis, prevention, and treatment of jaw, face and bite irregularities. With advances in modern preventative dentistry, there are fewer and fewer cases where orthodontic treatment is required to fix problems caused by missing teeth or cavities. However, there has been an increase in patients seeking treatment for cosmetic reasons, with the most common treatment being the use of braces to straighten the teeth. Alberta Dental also provide a wide range of other dental treatments in the specialist fields of Periodontics, Endodontics, Pediatric Dentistry and Surgical Instructions. How Competitive Are Alberta Dental, Los Algodones Prices? How Do I Book an Appointment at Alberta Dental? By using the Dental Departures website, you can book your treatment at the lowest price currently available on the market by taking advantage of our best price guarantee policy. You can even arrange additional medical insurance through us, at preferential rates, with a variety of independent insurance providers. from real patients, treatment and price lists, opening hours and even maps and travel directions. So, contact us today to reserve an appointment at Alberta Dental, Mexico.